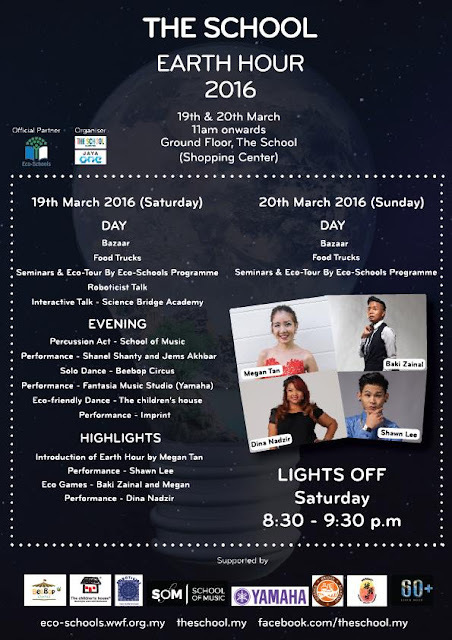 Earth Hour is coming this 19 March 8.30PM to 9.30PM. I am fully support the Earth Hour, and we practice switching off the light every year at home too. This year, it’s going to be something different. 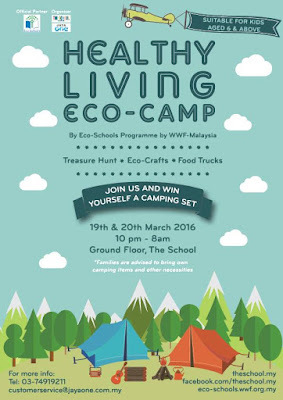 In conjunction with the Earth Hour celebration this 19 and 20 March, The School in Jaya One, PJ will be kicking off the Eco-Schools Training Centre in collaboration with the Eco-Schools Programme by WWF-Malaysia (World Wide Fund for Nature Malaysia) on the Ground Floor. This is going to be a cool event as we can expect myriad of educational workshops and exhibitions on sustainable living, live performances by talented homegrown artistes, food bazaar and a healthy living eco-camp throughout the two days. 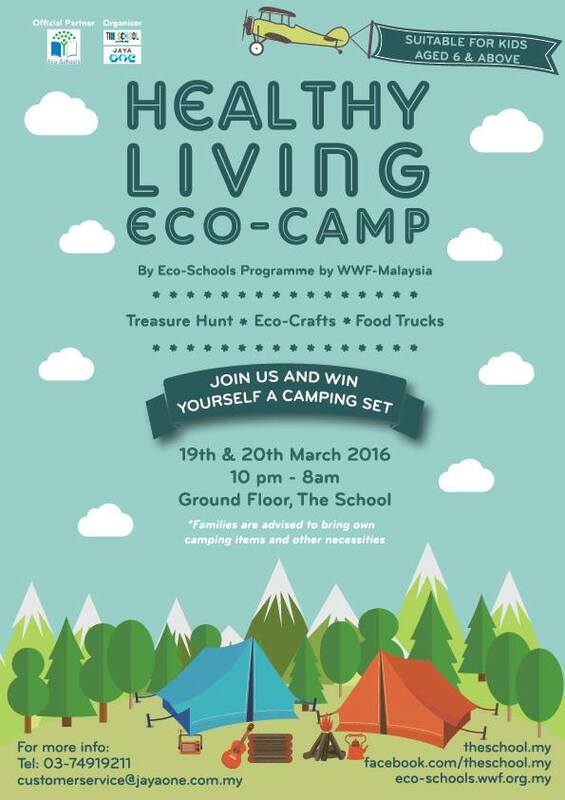 “We are very excited to be working with the Eco-Schools Programme by WWF-Malaysia to bring forth this meaningful initiative to all the families in The School. We hope that this training centre will help shift mindset and empower the young generation to start recycling their waste as well as to educate them that every little step counts in making the world a better place,” said Charles Wong, Executive Director of Tetap Tiara Sdn Bhd, the developer for Jaya One and The School. All the activities are open to public and will commence from 11am until 9.30pm on Saturday, and 11am until 4pm on Sunday. For all food aficionados, this two-day event is not to be missed as it also boasts various gastronomical delights featuring artisanal food vendors and food trucks ranging from local favourites to homemade desserts. On 19 March, the evening will be further enlivened as Megan Tan, the well-known TV personality, will be taking the centre stage to entertain the crowd. There will be exciting performances and appearances by the learning tenants in The School as well as a host of notable entertainers such as Dina Nadzir, Baki Zainal and Shawn Lee, just to name a few. 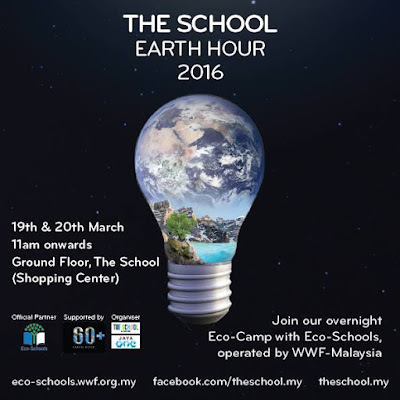 When the clock strikes 8.30pm, The School will be converted into a picnic in the dark for an hour as nonessential lights will be turned off for an hour in support of Earth Hour, a worldwide movement to raise awareness on climate change and other environmental issues. This year I’m gonna picnic in the dark during the Earth Hour at The School with my family. See you there! For more updated information on The School Earth Hour 2016, visit www.theschool.my or The School’s Facebook page at www.facebook.com/theschool.my. Sounds fun! I hope that the message of conserving energy will be taken home and implemented by the participants in the long term. Not just hangat hangat tahi ayam. It's a very meaningful event. A cool event for the environment! Wanna join! Wow! Such a lovely event... Wanna bring my kids go.. This is great. And just like Leonardo DiCaprio's speech about global changes, this type of event can help teach us about global changes. good idea, time to save energy too. wanna go check this soon! always support earth hour. this is a great idea indeed. Yay! Love this kind of events and hope to see you there. interesting event to join..will ask my husband and my sis to join this.